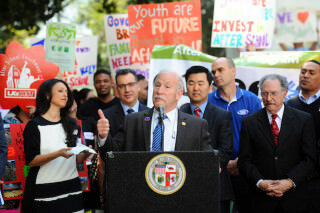 Members of the LA Unified School Board and the Los Angeles City Council joined last week with after-school program supporters, families and students to call for an increase in state funds. About 75 people gathered Friday outside L.A. City Hall in support of a resolution authored by City Council member David Ryu, chair of the city’s Education Committee, urging Gov. Jerry Brown and the California State Legislature to increase funding for After School Education and Safety (ASES) programs in LA and across the state. The resolution passed with all City Council members voting in support to increase school funding. In attendance were board members Scott Schmerelson, George McKenna and Monica Ratliff and council members Ryu, Bob Blumenfield and Nury Martinez. The effort was led by the California After School Advocacy Alliance (CA3), a group of organizations that work to enhance accessibility to quality after-school programs. The alliance stated that if no action is taken by the state Legislature this year, nearly half a million low-income youth in California – 110,000 in LA Unified – would be affected, and as early as next year 50,000 could lose access to the programs. As a result, California could see more dropouts, higher crime and at-risk students being left behind, it stated. In addition to supporting Ryu’s resolution, the CA3 recently sponsored a bill, AB 2663, that would help increase state funding to offset the costs of minimum wage increases and provide ASES programs with a statutory cost-of-living adjustment similar to other state programs. According to a Los Angeles Times report, that would raise the daily per-student funding rate from $7.50 to $8.50, creating a $73.26-million increase for the 2016-17 school year and providing LA Unified about $10 million more for after-school programs.